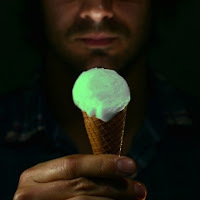 Glow in the dark ice cream? Yes, glow in the dark ice cream. According to CBS, some fellow invented an ice cream that glows in the dark. Charlie Francis runs Lick Me I'm Delicious, which is, apparently, ice cream related, and not what you were thinking it was (you're so naughty). It used a jelly fish protein to make it glow. Just like those Glowing Killer Muslim Bunny Rabbits we warned you about in the summer. So, did he synthesize the protein from jelly fish? If so, does this mean he's making Jelly Fish Ice Cream? Or did he use the Glowing Killer Muslim Bunny Rabbits as his secret ingredient? Meaning he's making Bunny Rabbit Ice Cream? Or, did the Turkish scientists steal his ice cream and feed it to their bunny rabbits? This is going to end up in court. Or on Twitter. Which is worse. IIRC Marie Curie was fascinated by things the glowed in the dark. Is this some secret plan to help drone targeting in support of Michelle Obama's new better eating initiative? It sounds like a solution to a non-problem to me. Do a lot of people eat ice cream in the dark? Finely, I will be able to tell if the toilet flushed well in the middle of the night. Does the new Dell laptop come in Baby Blue?